There is a Google Earth placemark collection for the Portugality ethnical heritage, mapping communities all over the world. See it here. Do you wish to report a mistake, an inaccuracy, claim intelectual property rights, make a comment or send a praise? Use the section Contributions in the menu on the top of the page. Your feedback is very important to make this page an usable and helpful tool. Thank you! In 1434, Portugal had less than one million inhabitants. Yet, the tiny nation, cornered between the ocean and the kingdom of Castille, launched into an oceanic adventure that forever changed the world and mankind. Cape Boujdour, a bend in the African coast in what is now Western Sahara, was surrounded by shallow waters and sharp reefs. 5 kms into the ocean, water depth was no more than 2 meters because of sand blown from the desert. The surf in there reminded those early navigators of boiling water. This is the place where the winds change making it impossible to continue south along the coastline. Sailors believed that beyond was the end of the world packed with monsters and sure death. Boujdour was the cape of fear. 15 expeditions were sent there by Prince Henry the Navigator, a hero of the conquest of Ceuta by Portugal and son of King John 1st. and Lady Philippa of Lancaster, whose marriage sealed the political alliance between Portugal and England, the longest lasting in the world of today. It took Prince Henry all his persuasion power to get yet another expedition to Boujdour. He convinced his squire, Gil Eanes, to go there one last time and try something new. Gil Eanes took one lone 30 ton. boat with a single mast, a round sail and deck cover and sailed southwards from the city of Lagos in Algarve in May 1434. When near Boujdour, instead of forcing south like all 15 before him, he sailed due west until no more land was seen. After a full day of sailing he came onto a zone with soft breezes blowing southeast and he took the same direction. When he sighted land again he knew he had passed the cape of fear. Africa was then open for exploration and in the next 200 years, the Portuguese established a trade empire going from Brazil all the way to Japan and the Isles of Spice (Indonesia). Diogo Cão explored the Coast of Gold (Ghana) and the Kingdom of Congo, Bartolomeu Dias proved there was a connection between the Atlantic and Indian oceans in 1488, Vasco da Gama established the trade route to India in 1498, Pedro Alvares Cabral took possession of Brazil for the Portuguese King in 1500, Afonso de Albuquerque conquered Hormuz in 1507, Goa in 1510, Melaka in 1511 and started the first contacts with the Moluccas islands in 1512 and China in 1513, Fernão de Magalhães became in 1522 the first man to sail around the world, João Rodrigues Cabrilho sailed into the San Diego Bay in 1542 and Fernão Mendes Pinto first visited Japan in 1544. The 1 million strong nation secured a world empire for the next 500 years, one that ended with the return of Macau to the People's Republic of China in 1999. 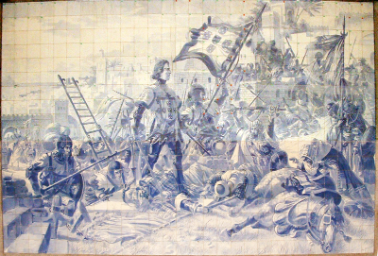 But the political empire was survived by the cultural empire, one that still exists today, crystallized around the 240 million speakers of Portuguese around the world and the many monuments and remains scattered around the world, testifying to the extreme diversity of the mix generated from the encounter of Portuguese culture with the cultures of the world. The Facebook group page Portugality (bi-lingual) was created and has been managed to serve as the meeting point for people who are today the living evidence of this unlikely adventure in Universal History, to know about each other and to raise awareness about the common heritage we share and keep for mankind. The use of English in that group like in this webpage serves to communicate with people in countries where Portuguese language is almost lost, but Portuguese customs and tradition still are very much alive. Initially, this webpage served as a repository of information about the built heritage still existing today all over the world, which testifies to the presence of the Portuguese and their influence in architecture, art, religion and civil organization. Here, organized by geographies, in the last 3 years, I inserted files with detailed locations of many places where the heritage built by the Portuguese can still be found and resources as to the history, pictures and drawings of each one. The final goal was to have a memoir of the Portuguese built heritage in the world to serve for purposes of conservation, historical reference and research. It would also serve to make Portugality a factor of pride and joy for all peoples who contacted and shared cultural links with the Portuguese in the course of history and an incentive to learn more about our common heritage. Since 2007, the Calouste Gulbenkian foundation in Lisbon funded a project coordinated by renowned Portuguese history scholar José Mattoso. The project was named «Portuguese Heritage Around the World – Architecture and Urbanism». It followed on the foundation’s tradition of preserving the historical heritage of Portuguese origin in the world, which has been a constant line of action since its creation in 1956. In 2012, the foundation established a protocol with four Portuguese universities to launch the website «Heritage of Portuguese Influence» in order to make the project results available to all and not just accessible in libraries. However, the coordinating team quickly realized that the website would be the perfect tool to continue the work of inventorying the heritage and further establishing a cooperative two-way work with any voluntary wishing to help in submitting information and media, wherever he would be in the world. This was much more than I could ever wish for the goal I set upon myself and I immediately realized that the continuation of my work in this website as it started would be redundant and puny when compared with the resources, the manpower and the scientific expertise HPI had available. I, therefore, decided to halt my project and team up with HPI by volunteering what little information and media I had that they lacked, as well as helping them research for more information on little known pieces of Portuguese heritage. This, consequently, will open a window of opportunity for me to delve into the second goal of my personal project: the charting and organization of the ethnical / cultural heritage of Portuguese influence. All over the world, in obvious places like Brazil, Angola, Timor or Macau but also in surprising places such as Bermuda, Trinidad & Tobago, Sri Lanka, Equatorial Guinea, Myanmar or Hawai’i, thriving communities descending from sailors, soldiers, immigrants, settlers and traders of yore exist with a very tender fondness for their cultural heritage of Portuguese inspiration. In dance, music, garments, religion, festivities, food and language they live on their everyday lives the allegiance to a long lost connection that can now be reset again by means of the Internet. In many cases, their pride of being «Portuguese», having had to endure discrimination, social isolation, persecution, exile and even war, is an inspiration to us, the present day citizens of this southwestern corner of Europe called Portugal. An inspiration and a solace in times of difficulty, as it tells us that wherever in the world a Portuguese may go, he is bound to find someone who shares the same cultural and ethnical allegiance. That is the most remarkable outcome today of the unlikely adventure started in 1434 when Gil Eanes sailed past Cape Boujdour.